Only four months late! ;-) You can either click on the links below or use the tag (canadian vacation 2015), or if you just want to look at the photos, the mosaic below links to the collection of albums (one for each park, plus an "on the way" album) on Flickr. Each of the individual trip reports has about 2/3 of the photos inline, and a link to the album on Flickr if you want to see the rest. Whew! When's my next vacation? We came out of Yoho NP just to the north of where we'd gone in to Kootenay NP a couple of weeks ago, so we drove by the same lakes and mountains we'd seen on the way in. But when we got to the intersection where we had come in to Canada on Rt. 93, instead of continuing south we turned northeast. We drove through Fernie, which looked like a great little ski town - kind of like Durango! - and we would have liked to have spent more time there, but we could see the end of our vacation looming in the distance and needed to keep moving. We camped at Crowsnest Pass between British Columbia and Alberta, which was beautiful, though ridiculously windy. Again, we drove by lots of interesting historic towns, but made the decision to maximize our time at Waterton Lakes NP. 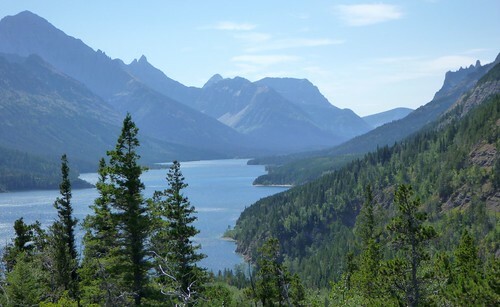 The interesting thing about Waterton Lakes is that it's right at the juncture between the Alberta prairie and the mountains, thanks to the Lewis Thrust Fault. It makes for a very cool contrast as there are high mountains in one direction and plains in the other. And in the middle there are great big beautiful lakes! More photos, fewer words at Flickr. On the morning of August 3rd we packed up our camp and headed back down the Icefields Parkway to the intersection of Canada's Rt. 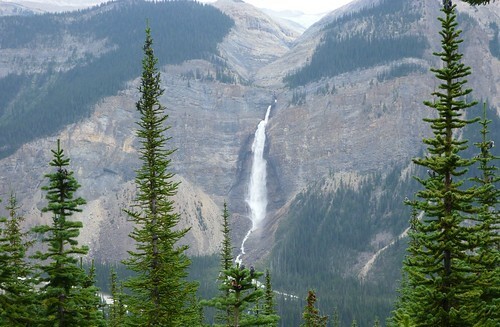 1, then headed west into Yoho National Park. Just before the town of Field, we made the sharp turn to the right and up the steep Yoho River Valley to the Takakkaw Falls trailhead. "Takakkaw" means "wonderful" in the Cree language, and this huge waterfall certainly is, tumbling 830 feet from a glacier down a nearly-sheer rock wall. 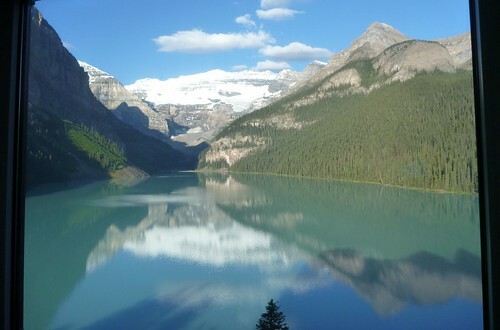 Our original plan was to go to Yoho National Park directly after leaving Lake Louise, but we hadn't realized that our departure date from the Chateau was the Friday before Canada's August Long Weekend. (That's what they called it. I asked the concierge what was being celebrated, and she shrugged. "It's just the long weekend holiday! It's not for anything!") The fancy lodge in Yoho that we wanted to stay at was booked up, as were all the advance campsites. So we made a reservation for later that week, and decided to take our chances at the larger campgrounds in Banff NP along the Icefields Parkway. Despite driving up before noon, we found no room at the campgrounds. Fortunately, the Canadian National Parks have fairly nice overflow campgrounds available; the one we went to, Silverhorn, was basically a big parking lot with picnic tables around the edges, but there were nice tent sites, a pretty creek, and the view was incredible. After a week of camping we were ready for a little luxury. Instead, we got a lot of luxury! 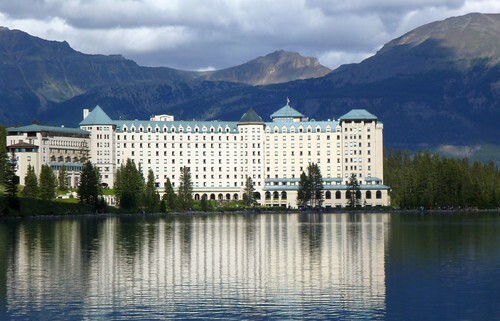 Britt had made reservations at the four-star Fairmont Chateau Lake Louise, right on the famous glacial lake. It's ridiculously expensive, but staying there, right on the lake, meant we wouldn't have to drive up the crowded access road or find parking, since we wanted to do several well-known hikes that begin at the lake. Since even the cheapest room was pretty pricey, Britt had splashed out for "Concierge Level" service. We took the elevator straight up to check in at the 7th-floor lounge rather than waiting in line in the lobby. This lounge also had an amazing breakfast spread every morning, and a huge array of appetizers and an honor bar from 5-7pm (you could easily make a dinner out of it, which we did several nights), and our 8th-floor room had a dormer window seat looking out to the lake. But they let us into Canada, and so that evening we rolled into Kootenay National Park and got one of the few remaining campsites at the National Park's Redstreak Campground. It was less than ideal due to the extremely loud extended family that partied all night next to us, but had the advantage of being hiking distance to Radium Hot Springs, where we soaked and enjoyed. The next morning we drove into the main entrance of the park, waving the annual pass we had bought at the campground. It's a real no-brainer - unlike US national parks, which charge $10-$20 per car good for the week, Canadian parks charge by the day and by the person, and if you are going to spend a week or more in the parks, it costs less to just buy an annual pass (for slightly more than $100 US), so we did. It also means you can just wave at your pass and drive through while other people wait in line! We headed out of town, finally, on Sunday afternoon July 19th. 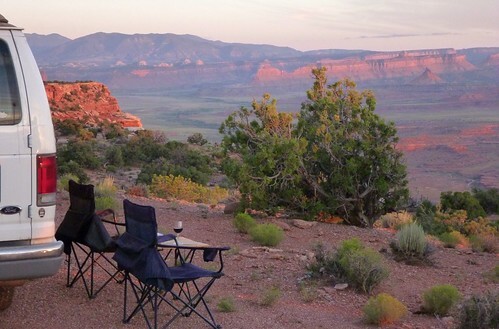 The fastest route north actually started with a westward leg toward Moab, Utah, so we made for the campsite at the Canyon Rims Recreation Area we'd been to on a previous trip to Utah, and enjoyed our first evening of vacation with some adult beverages and a beautiful sunset. Then it was north through Utah and into Idaho. In Idaho Falls we talked to a tourist desk guy who recommended we take the slight detour on the scenic route to Mesa Falls, and we did, and it was fantastic. Two enormous waterfalls! The next day, Saturday July 25th, we crossed into to Canada! 4: light at the end of the tunnel!